We have two areas in our production line that are very easy to fail at. In fact I noticed that we did this twice this week. We groove for drawer bottoms at a different height from the bottom depending on whether we are using tandem slides or accuride. We use the same dedicated saw and powerfeed to accomplish this. Use the the red whim with tandem and the blue shim with accuride. At door making station we have a two minute changeover for moving from Ovolo to Shaker profile. We only have two door profiles on the menu. You can have a whole chicken or half a chicken. You can have one scoop of rice or two. This works really well until it doesn't. We built and fit a perfectly made ovolo profile door for a kitchen that supposed to be shaker. We make this mistake often enough that when it happens nobody is particularly amazed. Other than outsourcing our drawers and doors does anybody have a suggestion about how to make this not happen? How about having an approved sample door to accompany the paperwork? As far as the drawers, how about making all drawers with the same bottom to bottom. Then trim it off if it needs the adjustment for the alternate slide. Unless you use melamine or plywood, we use solid stock for all of our drawers. Hope this helps, I will post again if I think of anything else for the drawer issue. Thanks for the input Dustin. What I am thinking about right now is to produce a list of processes that have to be initialed as you proceed. The initialization is an extra step that adds some accountability. Having to mechanically participate might make some impact on the auto pilot part of the problem. It doesn't happen often enough to warrant this extra step though the extra step might have some side benefits to it. Right now we gauge progress with unspoken agreements. If you want to know how far somebody got you either ask or look for clues. Both of these approaches have their downside. When you ask for a progress report the response you get back is sometimes subject to interpretation. Some of my crew are more articulate than others. Some of them have pretty good diction but no matter what they say it's as though they had marbles in their mouth. Trying to describe progress, particularly with newbies, takes time. A formal list would give them the ability to say " I am on Step 6." This lets the world (shop) know that Steps 1 thru 5 are complete and Steps 7-8-9 still need to happen. A formal list has a lot of other benefits, It could be used to establish protocol with respect to sequence and methods. You could use a list like this to certify competency. Certification is a common characteristic in all industries where people earn higher wages. This could be done in an analog fashion with a laminated checklist or electronically with an iPad. I don't follow sports very closely but I can vaguely see a flow chart like this in my mind for tournament status. Kind of like a bingo board. The job is not done until the bingo board is filled in. This may seem like an extra step but in reality is just a more formal way of polling the crew to see how far they got. This is something that's going to happen anyway, some how. It occurred to me as I just posted that last bit this is what Paul was speaking about when he said that writing helped to organize and coalesce his thoughts. When I started that thread about two doors we have to remake I ended up with a program that could reorganize our production management. DS could use the same program to manage decision making status for his customers. Could also just be an aneurism. First, why is it happening? Second, whats your standard or process for determining how job should be set up? I suggest that you have a simple visual process or checklist for the set up that spells out EXACTLY what the set up should be preferably with pictures. The great thing about a 1 page standard operating procedure is you can train anyone on it and not rely on tribal knowledge. Once you have a standard in place it also make managing people easier as you now can narrow the conversation down to 2 items, lack of training or not adhering to the standard. "Joe, we had a major mistake on the door set up, have I not trained you enough on how to do this properly?" No Bob, I dont understand it. "Great, lets get you better trained"
No, I understand the standard. "Joe, your failure to follow this standard has resulted in a costly mistake in time and materials, if you continue to deviate from our standards, it will affect your longevity at this company"
We have standards and checklists that spell out what and when. Before each process, verifying the contract is first on the checklist. 98% of our hardware is 96mm spacing and we drill our fronts in the shop. That 2% was killing us, since we put it on the checklist and got buy in from the people to check the contract before drilling, we now have no issue with it. We produce many of our items the regular method but about 24% have to be made differently in the build process. What we have done is to put a brightly colored 1/3 piece of paper with the special instructions in big letters with the order paperwork that goes with the order. This way the builders know there is a deviation from the norm and to pay attention to what this flag is telling you to do differently. Another idea we use is to have a set of production flags on each cart of material. As the cart goes through the processes, a tag is removed for each process. We have the tags labeled and color coded. This makes it very easy to walk into the shop and determine how far each cart is completed. I am a believer in dedicated equipment. If I had 2 door profiles I would consider two shapers. Two benefits, a decision has to be made before starting as to which profile. It significantly lessons the probability of an error during setup. If that is not an option I would question how many times the mistake was missed. Milling, sanding, assembly, finish. Labor and material continued to be added after the error was made. Does paperwork follow the job? Is each operator responsible to check that what he/she is getting is correct? Do the drawers stay on one cart? Perhaps having the person milling the parts grabbing the correct glides before they start and having the glides travel with the cart would fix the problem. Counterintuitive and it could add different problems but I think it would work. We cut drawer parts from strips for anything but solid drawers, the type of strip defines the groove location in the definition and groove width (thicker bottoms on wider drawers) Slide selection and material picks type. Then we have all the same in laminate and plywood. One of the best books I ever read about lean thinking was "The Toyota Way" by Jeffrey Liker. He has a really great way of breaking things down so they are easy to understand. I need to re-read this book. As I recall he told a story about two parts distribution centers in the midwest. One was a Toyota center and one was GM or something like that. They were located across the freeway from each other. These centers ship out parts to the various auto dealerships in their region. When a customer comes in and needs a new rear view mirror a replacement part is shipped to the dealership so she can have her car back tomorrow by noon. Both centers ship 70,000 to 80,000 parts each day. UPS & FEDEX trucks are constantly backing up to a loading dock and dashing off to their next pickup. The goal is to get them on their way as soon as possible so as to free up the dock space. GM accomplishes this with 70-80 guys. Toyota does the same amount of work with 45 guys. Other things I remember about this story have to do with where parts coalesce in the warehouse. Toyota does not store all ignition parts on the ignition parts shelves. Bumpers are not stored at the same location as quarter panels. They are similar in characteristic but differ widely in demand. The low demand products are located the farthest distance away from the loading dock. The high demand products are closest. They go through more spark plugs than spark plug wires so they store them accordingly. The major thing I remember was that Toyota distributed their tasks using a grease board. The work orders are placed with a computer but carried out with technology from the days of the civil war. He did not elaborate on this. I should see if I could reach the author to ask him about this. In thinking how we could apply this logic to my shop is what makes me think about bingo boards. A cabinet is not complete until it is complete. It doesn't contain any extra parts and can't ship without all the parts. I think the solution to production management lies in a bingo board. Interestingly I worked for one of the big three in different capacities in repair parts sales and marketing for 15 years before I started our company 18 years ago. All OEM's have dedicated trucks for delivery of parts as they have had for at least the last 50 years. Parts are loaded into cages for each individual dealer. They may overnight some parts but it is not the norm. You may miss remember the story. 30 years ago they used dynamic storage, there was no section for a type of part there was just a cubic space available that was filled. Then there was an "80%" section that was handled in many different ways. Eighty percent of sales were generated from 20% of the parts and those parts were handled differently. When I left there was a multi story carousel that picked those parts automatically It had been in use for many years. . I heard that it was recently torn out. I am not sure what it was replaced with. It could have run its lifecycle and was replaced with the next automated system. The only thing that did have its own spot in the warehouse was exhaust, that is another animal. That facility was 1.2 million square feet. There are 23 total parts distribution centers but that was the largest. What you are describing is post WWII. How big was this grease board? Must be pretty large to handle thousands of orders and 50 or more employees. Did you post this problem to get help with a solution or as a vehicle to share your ideas? Many ideas have been shared to help solve your problem. How does the bingo board stop the employee from making the wrong profile? I didn't read all the responses, but here's what I'd do if that was happening here. For the drawer bottom issue, that step of the routing would have a "picture" which is just a block of either Red or Blue attached to it (or it could be a picture of the tandem slide in Red or the accuride in blue), and it would print on the Work Order. If you don't have a computer system capable of doing that, a simple Red or Blue Hi-liter could be implemented by the person that checks your WOs before putting them on the floor. The door situation is almost identical, except I would attach a picture of the door detail, probably at the header of the Work Order, but could be at the routing step where that determines that detail. I assume the tandems are undermount and the accurides are sidemount? If so, why not groove all for the undermounts? The sidemount guides don't care where the groove is. A bingo board may not be the best analogy. The board I am describing is a graphical representation of current status for any given algorithm. While a bingo board suggests a spreadsheet like geometry what I am proposing is something that has linear direction to it. The alternative to this is relying on either brute memorization on the worker's part having two more shapers in the work cell. The second approach still relies on good citizenship to remember to use the right shaper. This bingo board reminds me of a trip I took one time to the San Juan Islands in a client's 2 seat airplane. This man had a materials supply business in Idaho but spent as much time as possible at his island getaway. Though he commuted on a regular basis and had the routine memorized he still pulled out a laminated check sheet to verify he had inspected the airplane prior to take off each time. The only thing that happens if we use the wrong profile in our cabinet shop is we lose a little money and have to make a new door. There is no such thing as a fender bender in the airplane scenario. Then there is also the question of value added vs non-value added labor on the part of your shop foreman. Strategy in production planning is just about 100% based on status. Passing out tasks and monitoring status is a clerk's job. If you can find a way to minimize the time spent on this part you free the manager up to actually manage methods, sequences and locations. We use a different slot position when selling accuride slides because it produces an extra inch inch of usable vertical height inside each drawer. It would appear that your employees are not reading the paperwork which should be a simple process. Creating a more complicated system for them to follow is probably an exercise in futility and yor results won't change, the reason being is that it is way to complicated. Simple visual control. Print one door style on blue paper and the other on yellow, put a red post it flag on shaker door paperwork etc. Just listened to The Toyota Way. It was a change in their parts warehouse for dealers. It reduced inventory by a large amount and decreased delivery times. The layout was modified and they were (off the top of my head) moving 2-3 times the parts per employee than one of the big 3 warehouses. Seems like there are two subjects being discussed in this thread - how to prevent mistakes and how to keep track of what stage jobs are in. Not that they are necessarily mutually exclusive, but to my mind one is big picture and one is details. We use Work Orders that have routing steps and instructions for the actual work being done. 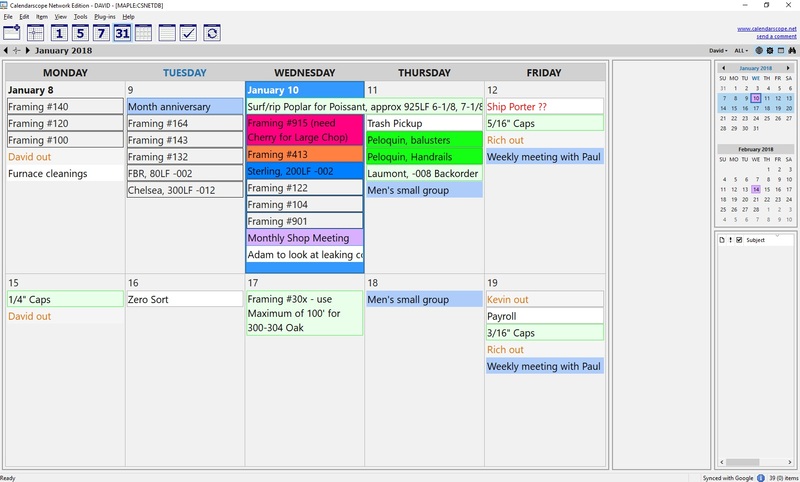 Then we use a calendar program to track/show progress. We use colors to show progress. The shop has a 40" screen where they can update progress at each step, and in the office each person that needs access can view it on their own screen, add jobs, etc. I should add, the shop's view of the calendar is set so that when a job is Complete it disappears. You are correct, there are two issues being discussed. How to prevent re-work and how to track status. As you also point out, these are linked issues. A long time ago when I used to smoke cigarettes my buddy asked "How can you be a maestro if it takes half your energy just to breathe?" The same question could be asked of production managers. How much of their energy is spent trying to simply ascertain field position and how much is left to actually apply to management? All strategy in a simple football game is predicated on status. On every play the coach ascertains where you are on the field, how much time is left on the clock, what the score is and what down it is. If you are miles ahead or hopelessly behind he gives the redshirts some time on the field. He does all of this based on metrics. This is no different in the shop except that field position is a much harder one to ascertain. There are also these vague things called leveling production etc that really should be paid attention to. The production manager in a cabinet shop doesn't have a lot of energy left to bear on this part because he is too consumed just trying ascertain field position or else mopping up from bad assumptions about field position. I agree with Gary. Your problem with the drawers will completely go away if you grove all of your drawer bottoms with a 1/2" bottom reveal. We are only talking about an 1/8" lost in interior height. I think YOU are over thinking this. Standardize your drawer bottom reveal. He spends a bit of time expounding the virtues of the measuring system he came up with, and while he definitely has a great principle regarding accounting for the width of the moulding, it appears that it's really just a system to repeat certain pre-defined dimensions, not "any size frame" as stated (although I could be wrong, I am basing my conclusion on 35+ years in the picture framing business and the visual evidence shown). I am guessing that if they only offer certain sizes, in which case it's sufficient, but in our business we have to be able to make ANY dimension down to the 1/64". just looking at the color coding. Color coding is how we drive at a speed of 60 miles an hour down the freeway, six feet apart from total strangers and nobody dies. Lack of color coding is one of the reasons our jobs move at the speed of glaciers and still crash anyway. Black & White colors indicate everything that eventually needs to occur. Yellow indicates things that need to happen next. Orange indicates everything that is complete. When everything is orange the job is done. Look out your office window and see how many things stand out that are yellow and/or orange. A green highliter on a list of processes might indicate those steps that do not require judgement and which cannot injure you. The greenhorn gets the green tasks. Red is a priority item. So, do you want to make money or subsidize others needs ? I saw color coding on the stops, but didn't see it integrated to the job. Might be there, just didn't see it. Per the video it could have been no different than your Blue/Red shim for slotting drawer sides. How does it translate. BTW, I believe color coding is a great way to make things easier, as long as they are either logical or easy to learn. Jobs done being orange frankly doesn't make sense to me. Orange is attention getting. Jobs that are done only need the attention of billing and shipping. Important tasks, for sure, but those can be easily accomplished by paperwork IME. In our case, we could make completed jobs Orange and just hide them from the Shop view (as we already do), but it would be entirely unnecessary with our current workflow. Heres a video of a few of the ways we use colors and visual controls. This speaks more to the status question. We use a Kanban card software, with standard workflows (stations) listed sequentially horizontally and jobs at that station listed vertically. Position in the vertical indicates priority. Each station has a procedural checklist 'stamped' on the job card when it moves into their orbit. Workers tic off the checklist as they proceed. Deviations from standard are 'alert flagged' with various colors, with special instructions attached to the card. Updates on the floor are with a shop computer, or, preferred by the crew, a cell phone with the app on it. We provide the wifi, so the guys don't pay for bandwidth. One of our regular subs also has access to jobs shared with him. Updates are real time - stamped with the user's ID. And an update notification feature allows for near immediate information exchange. We are in a high-mix, low volume job shop environment and this is set up is better than the phone-call-text-message-walk-over-to-the-shop non-solution we had before. Color is good! Reading instructions --- they may look @ them and not comprehend because they have already decided (w/o instructions, right or wrong.) We've tried check lists, hit or miss results. Often checked after the fact. Standardize as much as possible. It is the process that is standard not the product. Jim Conklin, what brand of software is that. We have tried a few, but have not been able to fine anything that is much better than the text, phone, walk NON-system. We use colors also for identifying status. That almost becomes full time for someone to move the colored block when the demand changes. We are a high volume, very limited on space shop. We have just enough custom items to always want a specified location for the next stage, but with job deadlines changing daily, jobs are always leapfrogging each other. We also lack built cabinet space, anything that’s built must go into a trailer, we have 7. We would need about 20 if we built the job that wasn’t ready for a day. That live type software with some color flagging would be great. Assembly guy just looks at the screen for which one is next, he builds the right one now because the job status changed 20 minutes earlier. In our current state the one that had a Physical block on it. Was built because the PM that answered his phone figured he would take off early and didn’t change the colored block. We're using Trello. The company 'host' is a paid subscription. All the other users create free accounts and are 'invited' to participate on boards and cards with various permissions. Alerts to changes on cards (jobs or job subsections) are automatically sent to participants. Works on desktop and mobile, so changes can get recorded almost as they happen. The ability to attach related images and documents is great. We are a high-mix low volume operation where the jobs are often kicked off before the fine details are specified (ex: finish colors and fabric choices). We also have a couple of subs connected with read-only permissions on selected jobs so they have the current versions always at hand. I wish it hooked into our CRM, but that would be too good to be true!